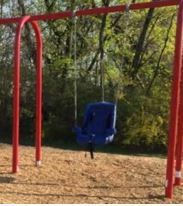 The Swing Set Specialist would like to extend our deepest sympathies to the Late Joann Zakrzewski who was a preschool teacher for children with special needs and to also say a special word of thanks to all the people to raised money on a GoFundMe for a Handicap Accessible Swing Set across the road from the school where she worked. She was only 31 and her memory shall live on with this new handicap accessible swing set and an opening ceremony was held recently at the Holster Park playground. She also won the district's Excellence in Education Award back in 2014 however 2 years later she died of a pulmonary embolism. Many thanks again to all who raised the $12000 to fund this Handicap Accessible Swing Set and we hope many kids will enjoy it in years to come in her memory – R.I.P. Posted in Media Stories and tagged Handicap Accessible Swing Set Clifton Preschool Teacher, Holster Park playground, Joann Zakrzewski, Zakrzewski Swing Set.